When selecting the right pot and soil mix for your succulents its very important to consider where the succulents will be grown. Choose a pot with a drainage hole if you can’t control the watering (outdoors). 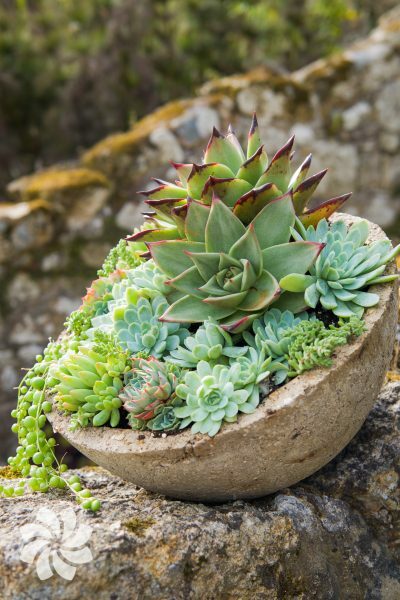 Use a small layer of gravel or grit in the bottom of the pot so your succulents won’t be sitting in water. We recommend using a standard general multipurpose compost mix or a John Innes number 2 (sandy soil mix) and adding 30% to 40% by volume of drainage media in the form of sand, grit or our favourite perlite. This will give you a free draining soil mix which is very important for the health of your succulents. Our Succulent Compost Mix is perfectly designed for our succulents. Without proper drainage, your succulents might suffer from root rot and struggle, especially in the winter months. Always make sure your drainage holes don’t become blocked. Having proper drainage gives you the desert like conditions that succulents need to thrive. Most succulents will love bright light and airy conditions, but some will love shady conditions. Knowing your succulent requirements is crucial when selecting placement and compatibility. Unlike other plants and due to their waxy leathery leaves, succulents can tolerate very windy conditions and still be very happy. There are even many succulents that can survive in low temperatures below freezing if free draining conditions are met. This can normally be found on vertical free draining walls, rockery beds, or a windy dry part of the garden. 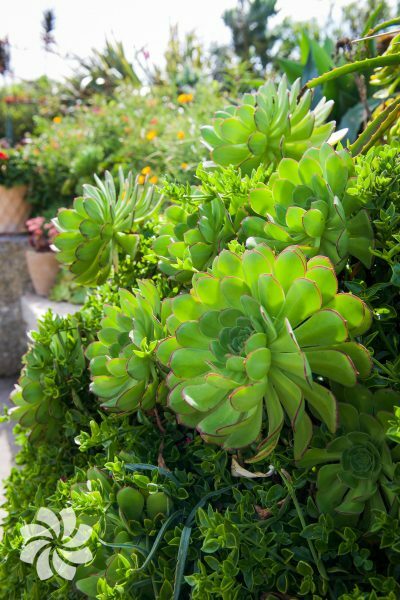 Over watering is the most common cause of succulent problems. Dependant on where you are going to keep your succulents depends on how often you need to water them. If keeping your succulents outside, you can probably get away with never watering your plants here in the UK. The rain every few weeks in the summer should be sufficient to give your plants enough water. Succulents store a high percentage of their water in their leaves and stems so they don’t need to be in continuous wet soil to draw up moisture like other plants. In fact, you will find that allowing the soil to dry out in between watering will make your colours more vibrant and stronger, giving you a hardier stronger succulent. When keeping your succulents indoors it is best to allow for the soil to become dry in between waterings. When you do decide to water, it is best to soak them, this will replicate a torrential down pour (heavy rain shower). Little and often is not a good idea. You want your succulents to reach its roots out and develop a strong, robust root system trying to find nutrients and moisture. Achieving this will give you a much hardier and stronger plant. Depending on the inside temperatures, you might water once a month or once a week. If your house has central heating turned on, then you may find your pots drying out faster. The best way to tell if it is dry is to pick up the pot and try to get a feel by the weight of the pot to figure out if it needs water. This might sound completely different to keeping normal plants but we believe this is what makes succulents a joy to keep as they are very low maintenance plants. The more you leave them alone the more they will reward you with growth rates and stunning colours and form. We often get asked how do our succulents have such good colours and it is because we keep our succulents in this way. For example, the Aeonium Glandulosum commonly known as disc houseleek, can be a lush green colour but when kept in dry conditions it can turn a deep vibrant red. This plant will also change colour before flowering. If your colours are looking washed out and not as vibrant, it might be worth cutting back on your watering regime or simply not potting your plants on. Once your succulents start competing for water and nutrients you will often find the colours will become naturally enhanced simply because you are replicating their natural dry conditions. Often people think that you need more water and feed to enhance the colours but it’s often the opposite. In fact, less is more for these fascinating plants. Selecting a plant for the right conditions you have at home is crucial. You might find that you get odd growing formations know as reaching. This can simply be because you’re not providing enough natural light for the plant you have chosen. Haworthias are great indoor plants suited to lower light conditions but at the same time can tolerate high light conditions. Aeonium ‘Sunburst’ and Aeonium tabuliforme (dinner plate) are a good choice for shady conditions, but will often fade or yellow out and even suffer from leaf burn if light conditions are too strong. Some Aeoniums would be green in colour if they were not receiving enough light to produce their dark leaf pigments. This is often found in the winter months when light levels are lower. You need to monitor to see if your succulents are growing with the right growth formation and vibrant colours for which they are known. To ensure you’re getting good growth rates from your succulents we normally recommend that you refresh your soil every year. If planted in pots this can be easily achieved. If outside permanently planted in the ground, we recommend feeding with a general all-purpose plant food. If you want to slow growth rates down, then simply leave your soil to run out of nutrients. This will stop your plants growing as fast, it can be several months before the plant will run out of nutrients and become detrimental to it’s health. It will happily survive, as these plants originate from low nutrient deserts like conditions with little rainfall, so they are well adapted to be without. The main growing season for Aeoniums is in spring and especially in the autumn. This is because the temperature and light levels are favourable for this type of succulent. This type of succulent will often go dormant in the summer, this can be seen when the growing rosettes draw in to a closed tighter leaf formation and often outer leaves will dry up and drop off. When this happens this type of succulent will happily live off of its own nutrients and water stored in its leaves and stem. They are in a dormant state and will not accept water from its root system. This is normal, so don’t try to over water this type of succulent during the hot summer months. You will see the rosettes and leaves open up when it has come out of dormancy and now requires watering again. Echeverias are a type of succulent that displays a wide variety of colours and sizes. From tight compact clump forming varieties to surreal shaped leafy giants. Their colours can range from green, pink, red, purple, blue, black, brown and even white with often multi colour leaves in one specimen. Examples such as Echeveria subsessilis, Echeveria setosa var. deminuta or Echeveria colorata ‘Desert Harmony’. Echeverias will grow from spring right through till autumn. During the winter months they will go dormant as the temperature drops beneath 10oc. Below these temperature they will appreciate being on the dry side. 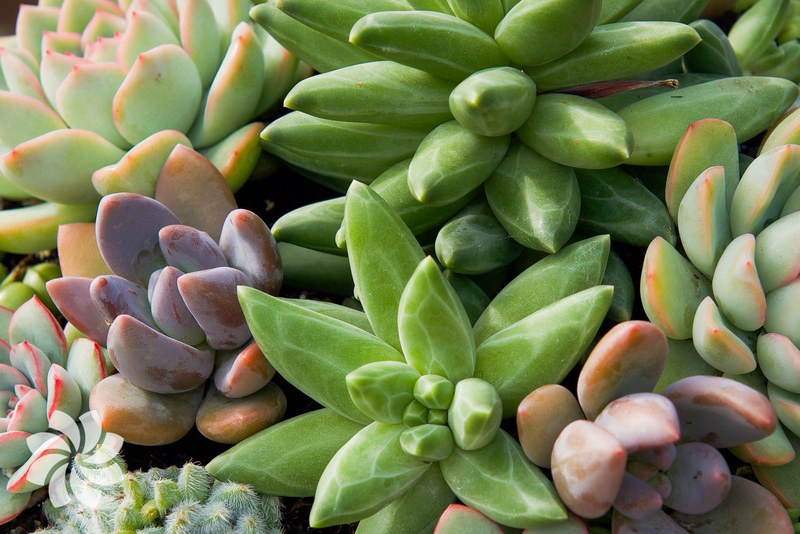 Remove any dead leaves and sparingly water these succulents until spring or temperatures warm up. Make sure the roots are dry before watering during this period. For more impressive growth rates and healthier succulents for the winter, we re-pot with a higher nutrient based compost. You can even add a 3-month slow release fertilizer in mid spring to the standard mix above. This will encourage new off sets and plenty of flowers. The overall health will then be much stronger heading into the winter months. Having read your advice notes, and viewing your website, I must say I am impressed. Thank you for your kind words, we are glad you enjoyed it. Just short of a year ago, I received 2 Crassula ovata variegata from you. Both have been growing well! Many thanks for the great service. I intend to make another purchase very soon! Hi my plants have arrived they are fabulous thank you so much. Very well I am now building up a lovely collection many thanks. Hi, thank you so much for your patience and advice over the phone! This article is very easy to read and helpful too! My succulents have arrived safely and I have now planted them in individual pots. The website offers such a vast and wonderful selection of succulents and I would certainly order again! Today my Aeoniums arrived. Carefully wrapped up they’ve weathered the journey to Germany very well and I am quite over the moon just looking at them. Since these are my first succulents ever I find this advice section quite helpful. All in all: I hope I’ll see you on Gardeners’ World again, only this time recieving Chelsea Gold! I received my plants, yesterday, speedily and in perfect condition. They looked exactly as depicted in the photographs on your web site, so I’m looking forward to the journey ahead. Thanks very much. Plants arrived as expected in excellent condition. Ready now to join all their ‘brothers and sisters’!! Thank you for the detailed advice on care. It’s very difficult to find this information elsewhere.